Want to make your romantic evening special? Break the chain of traditional candle-light dinners and let nature unveil its magic. Here are five best places to enjoy the charm of sunsets with bae. Sometimes a walk through nature with your one and only by your side equals perfect romance that you need for an evening. And once your are at the end of your walk, you get to see the sun set, and that too from the top most point in the city. Once atop, you can look over Pashan on one side and SB road on the other, while peeking at the entire stretch of Kothrud on the way. The hill can be accessed from both Chhaturshringi, Kothrud as well as from Pashan side. Start early and try to reach by 6pm. If you wish to add some adventure to romantic evening, head straight to Lohagad fort. The trek isn’t an extensive one, you can walk with your SO at a leisurely pace and reach atop without fearing that exhaustion would ruin your perfect evening. Head up, once there, you can lose yourself to the majestic view in front you with your partner by your side. Once you both are done brooding over the setting sun, you can head down and enjoy the street food stalls there. Holding bae, watching the sunset and swooning over nature! 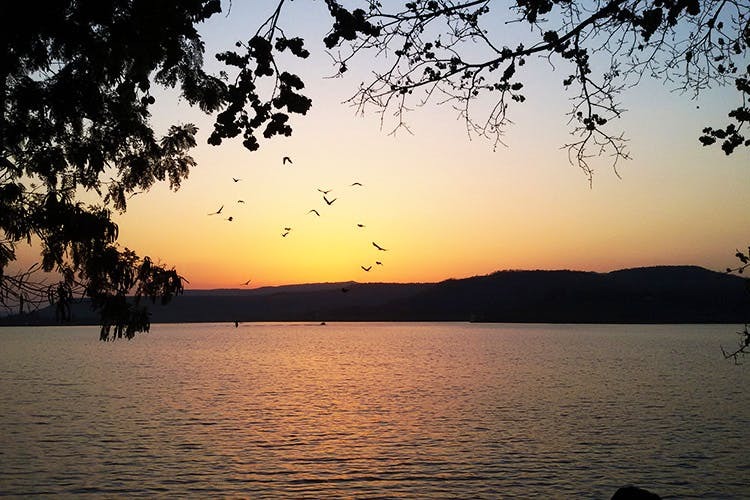 You can find a perfect package for a romantic evening at Mulshi Dam. But it gets even better when you have small waterfalls nearby let the romance flow. Situated on Mula River, the dam is not so far from Hinjewadi so you can easily ride a bike or book a cab to the place. Though there are not many eateries in the near vicinity, you can always parcel food and enjoy it near the damn. Better still, you can enjoy a barbeque-with-bae there if you wish to stay for a few hours. A lush green hill right at the centre of city, Taljai Tekdi is yet another getaway for you and bae to marvel the beauty of the sunset along with enjoying the beauty that nature has to offer. Don’t forget to look out for some beautiful peacocks there. There are eateries available at the entrance of the hill. There isn’t much public transport available so you will have to book a car or get your own bike. Imagine the sun setting behind the clouds and then taking a dip in a vast expanse of water while you hold hands with your love as water splatters against both of your feet. How romantic can it get? But wait, imagine you and your partner sharing a corn or fighting over the last kanda bhajji or pani puri in this setting. This picture perfect setting is found at Khadakwasla Dam, near Sinhagad fort. You can either take the bus to Sinhagad or hop on your bike to reach here. But make sure you reach here before 6pm to enjoy the beautiful sunset.